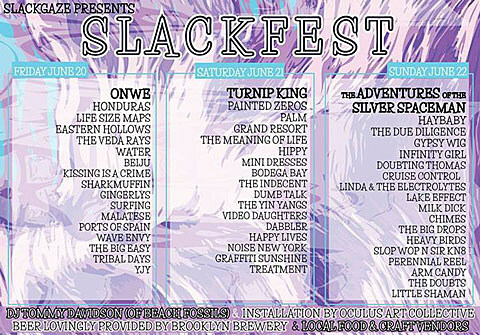 Mentioned briefly before, The Slackgaze zine is throwing a three-day festival in Bushwick this weekend (June 20 – 22) at 94 Evergreen Ave dubbed “Slackfest” with 50 or so bands, mostly local, playing. It kicks off today (6/20) at 3 PM, with such bands as Honduras, Sharkmuffin, Gingerlys, Life Size Maps, ONWE and loads more, and bands playing Saturday (6/21) and Sunday (6/22) include Turnip King, Grand Resort, Hippy, Haybaby, Arm Candy and more. 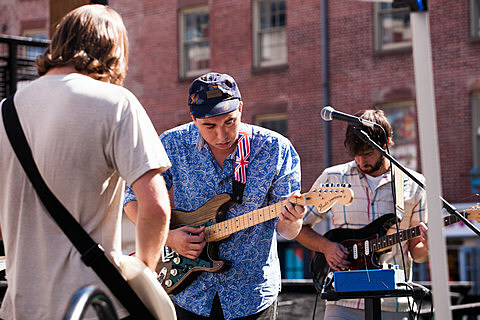 One band you would think that would be playing Slackfest but isn’t: Total Slacker.